My kids have a habit of calling rodents and squirrels by the name “Peanut” ever since reading the Magic Tree House books where the two protagonists, Jack and Annie, adopt a mouse by that name. (Turns out the mouse is much more than meets the eye, but you’d have to read the books to find out why.) Hence the name of this week’s picture which is really just a quick snapshot I happened to fire off before this squirrel scampered off to find food, shelter, or maybe just a playmate elsewhere on campus. I often talk about the benefits of having your camera with you and here’s a prime example of why it matters so much. 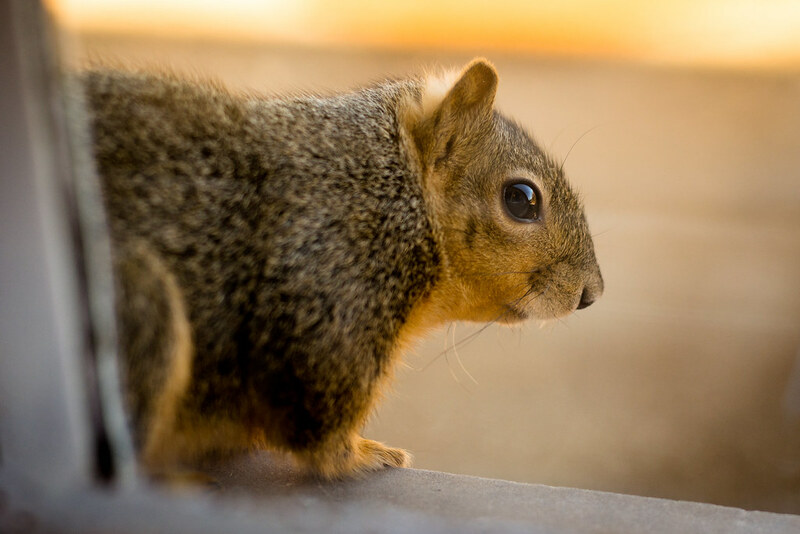 In the four and a half years I’ve been at my current position at OSU I’ve seen squirrels wander outside on the ledge of my third-floor office maybe a half-dozen times. It’s just not something that happens very often, and when it does I always like to pause what I’m doing and just sort of watch the little creatures do what they do. It’s a fun little distraction to see them up close, and they usually just stick around for ten or 15 seconds before going back to whatever it was that they were doing. 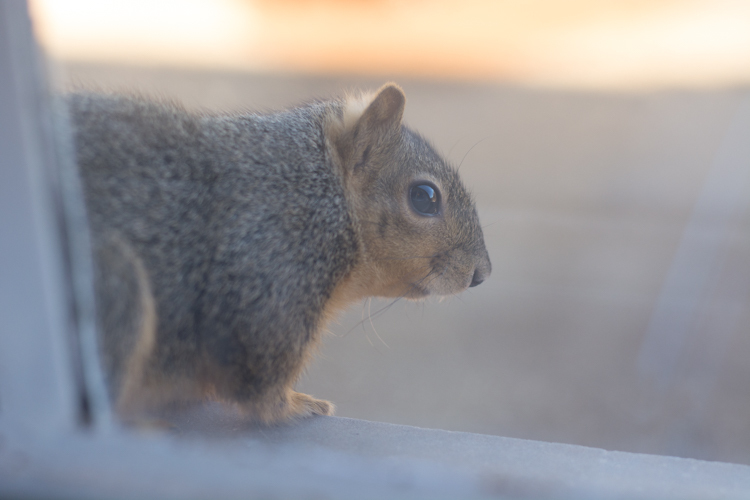 When I took this I had my D7100 + 50mm lens with me and even though there are two panes of glass between me and the squirrel (with about four inches of space between the panes) I was able to get a fairly decent image. I didn’t have time to do much in the way of composition but I knew I wanted to get his (her?) eye in the shot so I crouched down low, put my aperture at f/2.8, and focused right on the eye with the hope of getting a nice sharp shot. There was a ton of glare from the window in the original RAW file but nothing that a little Lightroom editing couldn’t fix–mostly by adjusting the Highlights/Shadows/Lights/Darks sliders. Original photo. Thank goodness for shooting in RAW! It might be a while before this opportunity presents itself again and if so, I’m happy to have gotten this shot while I was able to. It’s fun to try things like this (I almost didn’t even reach for my camera, thinking there’s no way I could get a good picture) but I’m glad I went for it anyway. You must be a quick draw to get your camera out and get the shot before the squirrel ran off. I probably wouldn’t have even tried, figuring that it would be gone before I could get ready. Congratulations on five years. I don’t remember when I started following you, but it has been a productive journey. You have given some informative insights that have helped me to see things that I might have missed in my photography. Looking forward to the next five years. Suc a cool and cute little tree rat. Did you know in Marysville, Kansas it a $150 fine if you hit a black squirrel with your car? True, and the ones who had infiltrated and re-populated here in Havelock, all started by a sweet little married squirrel couple who fell onto a truck down in Maryville and then fell off again in Havelock! The black squirrels first started at 68th and Ballard, and they have now migrated down to the Park at 63rd and Morrill. I can’t wait for them to move in my neighborhood at 62nd and Kearney. another great shot. You’d never know there was glass between you and this little Peanut. And 5 years! That is dedicated blogging for sure. I may not comment often, but I always enjoy your photos and especially the stories and tips you share. Thank you for the inspiration each week ! Always enjoy your weekly offering. Nice to find such an encouraging and inclusive site which is free of the nastiness found in some others. We (I) can engage with you on your photo journey as we all experience the same trials, tribulations, and successes on our own journeys.